I've had this urge to buy another handbag lately. Why? I don't know. I certainly don't need a new one. So I decided to knit one. I used a pattern from from Two Old Bags, called the Lucy Bag, to make one about 18 months ago and I get a ton of compliments about it. I had 4 balls of Noro Kureyon on hand and decided to use that for my new bag, also a Lucy bag. 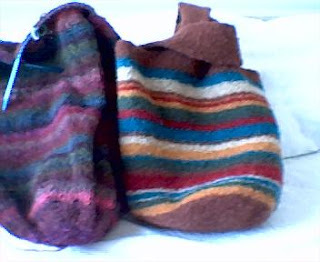 The new one (still in progress) is on the left, and my old one (made with Knit Picks Wool of the Andes) is on the right. I'll post a picture of the new one after I felt it.